Boost has a wide range of products. Recently I had the opportunity to get a case of this specific product in exchange for an honest review. What makes this product line different is the extra protein. 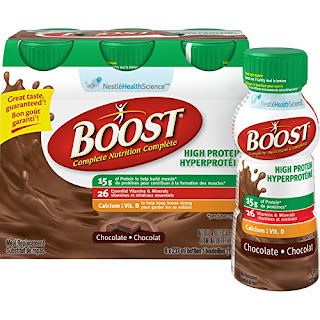 It has 50% more protein than the regular boosts, and hos more protein than all but the Diabetic formula. But this product needs to be considered on a number of levels. First it does have a good taste; it is not chalky and does not have a strong after taste. Second it has almost all of the high trigger allergy ingredients; milk, corn, soy and it also has 15g of sugar, which is about half of the current daily recommended for men and almost two-thirds of the recommended for women. So this is more like a milkshake than a protein drink. And finally there are many people I know that have concerns about Nestlé's business practices, especially around water sourcing. So when you weigh the three considerations this product some in with a low rating. I would use it in a pinch to get me through but would be unlikely to stock it and use it on a regular basis.